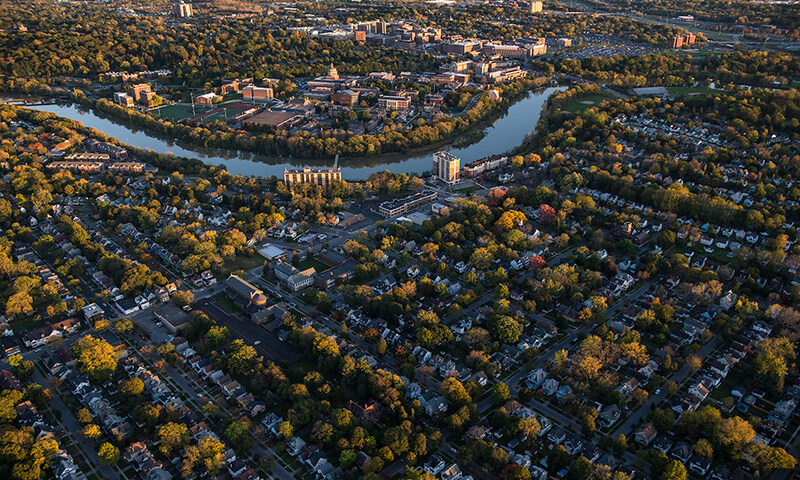 The University of Rochester has added 9,000 employees over the last decade, making it the 5th largest private sector employer in New York State, and largest upstate-based employer, according to a new report by CGR. The new report details the employment and payroll, capital expenditures, purchasing, student and visitor spending, and tax impact of the University of Rochester, UR Medicine, and its affiliates during 2017. UR Medicine affiliates include Highland Hospital, F.F. Thompson, Noyes Health, and Jones Memorial Hospital, many of which are the largest employers in their respective communities. Data from St. James Hospital was not included in the report as its affiliation with UR Medicine occurred after December 30, 2017. Since the last CGR report in 2016, the University has grown by 2,300 FTEs, a 9 percent increase. Over the last 10 years the University has increased by more than 9,000 FTEs and made capital investments of more than $2.7 billion, including major projects such as the Saunders Research Building, Golisano Children’s Hospital, Wegmans Hall/Goergen Institute for Data Science, UR Medicine’s Imaging & Autism Care Center, and the NextCorps high tech business incubator in the Sibley Building. The report notes that education and healthcare have become a major component of New York’s economy with 20 percent of all jobs and 15 percent of all income in state attributable to the two sectors. 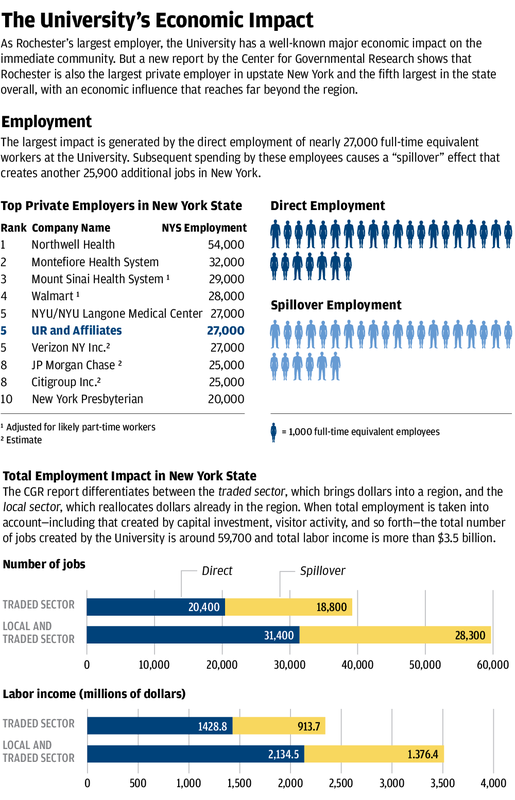 Six of the top 10 largest private sector employers in New York State are universities/academic health centers or health systems. With 31,000 employees (27,000 FTEs), the University of Rochester is tied for 5th largest statewide and is the largest upstate-based employer. The University is responsible for directly and indirectly sustaining an estimated 59,700 jobs in the New York State economy. This is up from an estimated 54,000 jobs in 2015. The University and its affiliates are responsible for a total of $3.5 billion in labor income. Rochester students generate an estimated $99 million in spending per year. The University and its affiliates purchased goods and services totaling nearly $1 billion in 2017. About 430,000 people attended a University event in 2017. An estimated 40,000 people were out of town visitors who lodged more than 35,000 hotel night stays. The University’s spending and activities generated $207 million in sales, personal income, and property taxes to state and local governments. Read the full CGR report.